Now in its sixth season, the only online professional nail art competition is ready for the games to begin. After collecting applications from around the world and settling on challenges with our sponsors, all that was missing were 12 brave competitors who would go head to head January through June for a shot at the title. After back-to-back pre-challenges sponsored by Swarovski Crystals, we are happy to announce the 12 competitors left standing. 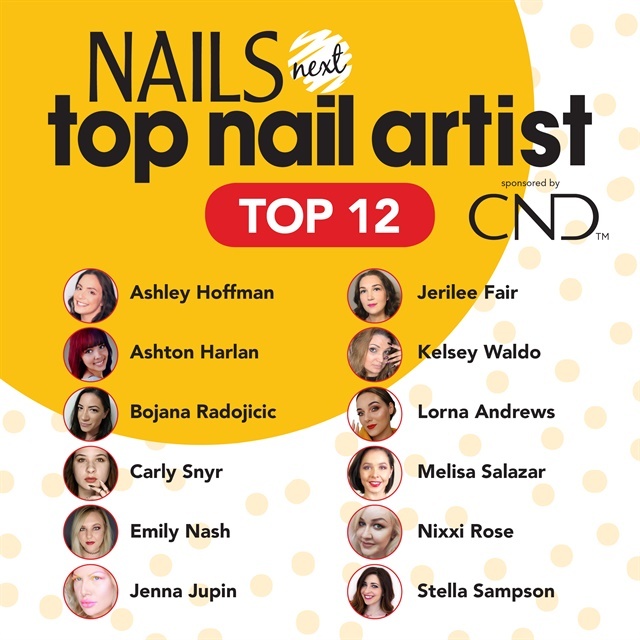 Guest judge Gina Silvestro, NTNA S. 5 champion Valerie Ducharme, CND's Jan Arnold, and the NAILS staff scrutinized every entry (including artwork, tutorials, and descriptions) to award these 12 spots to the most deserving nail professionals in the world. These 12 competitors aren't the only thing that's new about Season 6. This year, we welcome new sponsors, including the Fan Favorite Competition sponsored by Gel II. KUPA TV will be recapping the competition each week beginning January 2 and going right up until the finale at Premiere Orlando on June 1. Voting begins Janaury 22, 2019. Judges for Season 6 include former NTNA competitors Lauren Wireman, Deanna Stelmaschuk, and current champion Valerie Ducharme. Other judges this season include some of the biggest names in the nail industry: Tammy Taylor, Allie Baker, Elaine Watson, Denise Wright, Shanee Pink, Anastasiia Morozova, So Yong Yu, and Blanca Martinez. Special thanks to American Dawn, the official towel sponsor of NTNA, KUPA -- the official E-file sponsor, and Swarovski, the official crystal sponsor of the competition. How did we arrive at these 12? View the first pre-challenge, Drop Dead Gorgeous, sponsored by Swarovski crystals here. View the second pre-challenge, Wanderlust, also sponsored by Swarovski crystals here.